Where has the time gone? 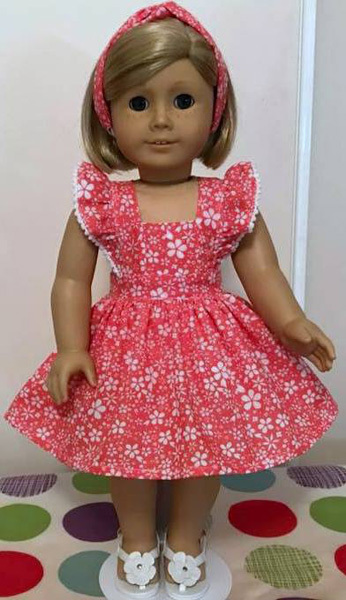 It’s been ages since I did a Share and Tell blog and there are lots of gorgeous photos I have to share with you all so let’s get straight into the first one which is from Barbara who has made my Winter Nightie pattern for a Waldorf inspired doll and she’s used unicorn print fabric which seems to be sooo popular at the moment with little girls. ‘Here is a picture of the nightgown I made. I loved the pattern and really loved the video directions. 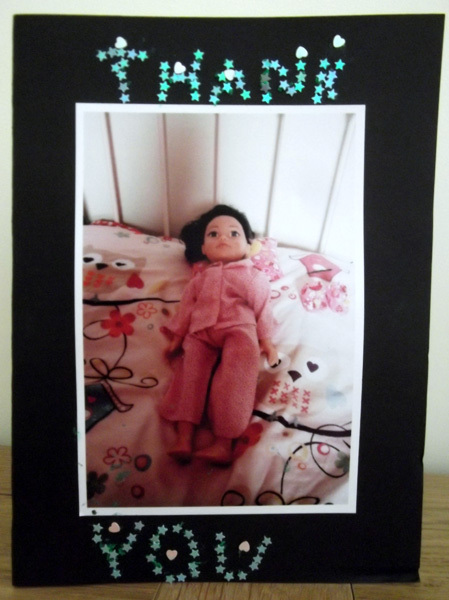 This is a Waldorf inspired doll I made and it fit perfectly…….Your site is excellent and full of useful information. I was happy to find you. 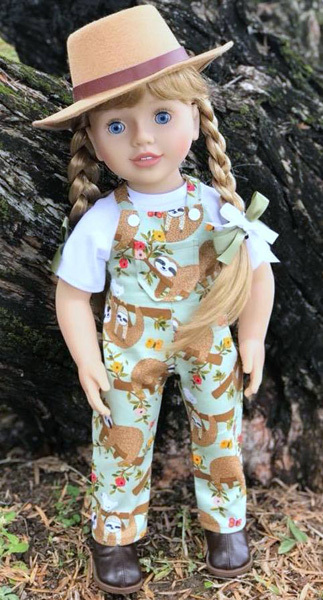 I’m happy you found my website too Barbara., you’ve done an awesome job and I can’t wait to see what you make for this adorable doll next. 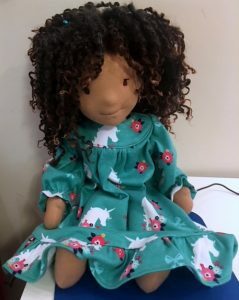 Next we have some photos from Pauline who has been busy making doll clothes and sending some of them half way around the world! The best part is that the recipients have been so thrilled with their gifts that they have made a special ‘thank you’ card that would melt your heart! I thought you’d like to see the lovely thank you card I received from the nieces of my son’s partner – Breege – who live in Ireland. 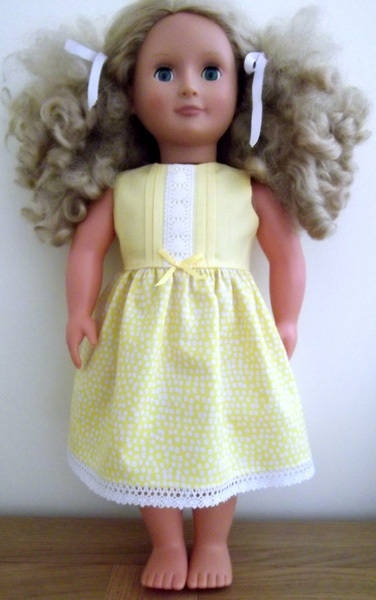 I had sent them some dolls clothes from your patterns and they have really enjoyed playing with them. Amelie even used her birthday money to buy a new doll to fit the clothes! The first photo shows the doll wearing the pyjamas and slippers I had made. The other photos show some of your other patterns with trimmings added. Thank you so much for your patterns, Rosie. I’ve really enjoyed making them and my 2 granddaughters and now Breege’s nieces have really enjoyed playing with them. The last couple of months we have been having a lot of fun in my Facebook group as we’ve introduced a monthly Sew-Along. 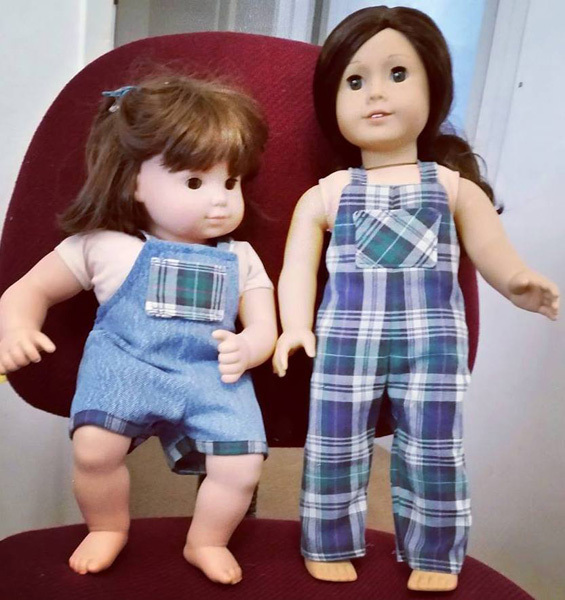 The first month the members who wished to participate had the choice of sewing either my Pinafore Dress & Skirt pattern or the Overalls for All Seasons pattern and OH MY GOSH, we had lots of wonderful creations. 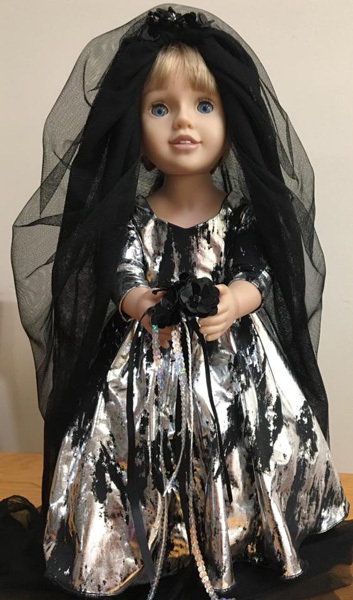 Then this month we have been working on Halloween outfits or Melbourne Cup attire (for the Aussie ladies) and again, there have been lots of awesome outfits so I’d like to share some of them here. The first group are some from the pinafore Album. Helen made the first one adding tiny trim to the ruffles and adding extra fullness to the skirt. I loved how this turned out and ended up buying some of the very same fabric. 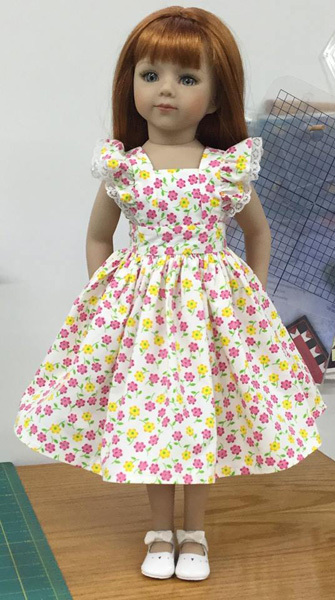 Norma adjusted my pinafore pattern to fit her Maru doll and the result it just gorgeous. I’m also loving how Deborah used a vintage hand embroidered placemat for her pinafore. Deborah ended up being drawn as the winner of our random participation prize which is the choice of one of my patterns, so congratulations Deborah. 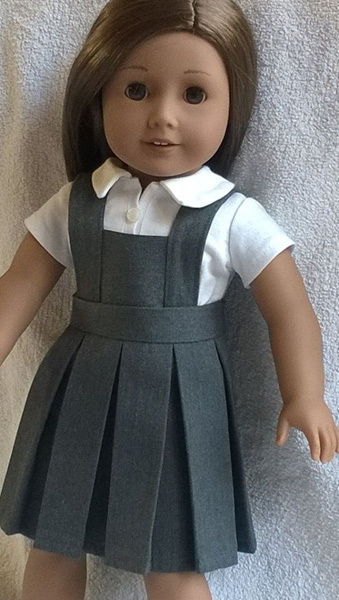 Ruth followed my video on pleating and created box pleats on the skirt of the pinafore instead of gathers to make this adorable school uniform. The next group of photos are from the overalls album. Laurie made both the long and short versions of my Overalls pattern using an old pair of jeans and shirt – didn’t they turn out awesome! 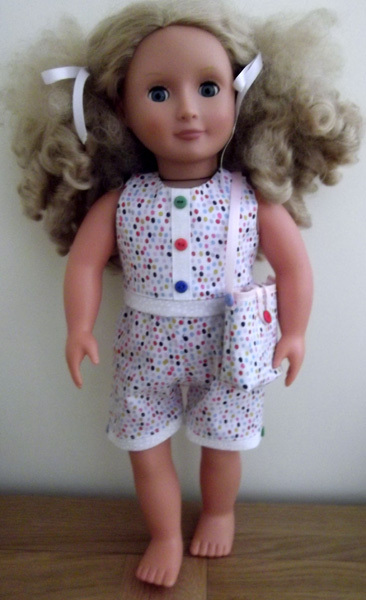 She was also thrilled that the 18” short overall pattern also fits her 15” Bitty Twin. Check out the cute ‘sloth’ fabric that Karen used for her long overalls. Originally Karen was not going to have a pocket but found with the large print the seam down the middle was too obvious so reshaped the pocket and ‘fussy cut’ it to showcase one of the adorable sloths and now the front seam is far less noticeable. Great job Karen. Then we have this super cute overall made by Vera. She added lace to the hem to make it more ‘girly’ and matched the heart pocket to the blouse which she made from the bodice of my 50’s Vintage Dress pattern. How clever is she! This month has show to be super fun with lots of fantastic Halloween costumes. The first one is Julie’s interpretation of Dacula’s Bride from my Wedding Dress pattern. She originally went looking for black satin but couldn’t pass by this spandex especially seeing as it was on sale! Although this was an unusual fabric choice, Julie went slowly and the result is absolutely awesome! I wonder if Linda went a little ‘batty’ making these cute Winter Pyjamas? The black contrast on the collar was a great idea. There’s still two weeks until Halloween so that’s plenty of time to make a Halloween costume. 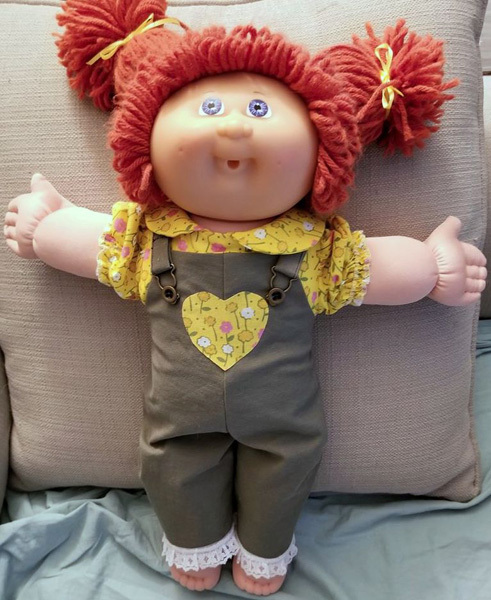 You’ll find my 18 inch and American Girl Halloween patterns here and my 18 ½ inch Cabbage Patch Halloween patterns here. 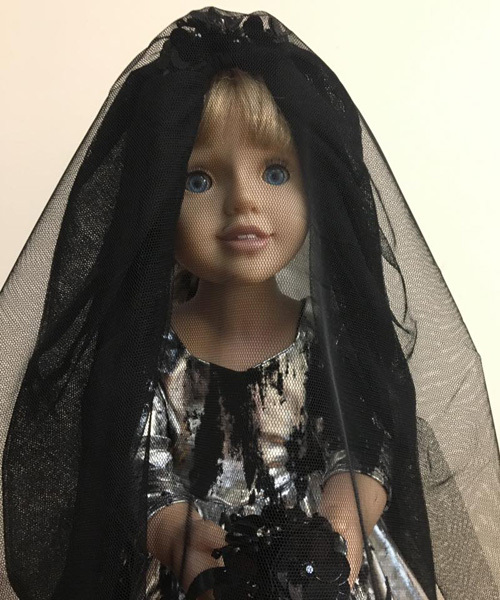 Remember that all my doll clothes patterns come with step-by-step video instructions so you can whip up a witch in no time at all! If you would like to join my Facebook group and be part of a really fun sewing community full of supportive members who provide endless inspiration, simply go to my Facebook page click on ‘Join’, answer a couple of easy questions and as soon as I see your request and approve it you’ll become part of this special group. Just be aware that I’m in Australia so please be patient because with the different time zones around the world, it may be a few hours before you are approved. Thank you for your creative contributions Ruth, the pleated skirt on the pinafore is perfect! Oh Rosie these are all so lovely. I especially love all of the pinafore dresses and overalls. All pictures are lovely though! Everyone did such a great job and so creative! Yes Kathy, they all did a wonderful job and thank you for being an awesome member of our Facebook Group! How exciting to be part of your blog again, Rosie. I am sure having fun sewing your patterns! I absolutely love your videos that accompany your patterns. It is so much easier to see what I need to do rather than just read it. The video saved me just last night making booties for the American Girl doll. I have never made clothing before, you make it easy! So happy to have found you!! Thank you for choosing one of my efforts to include in your Blog Rosie it’s a privilege to be included. I’d be lost without your wonderful patterns and your videos are priceless.